I have heard about Pine Tar soap for a long time but I haven’t actually tried it before until I used this Pine Tar Soap from Beardsmith and wow have I been missing out! The first thing I look for with a beard Soap or Shampoo is the lather, does it produce a nice lather here in Essex with our hard horrible water and the answer in this case is yes, a very big yes! Pine Tar Soap from Beardsmith produces a thick rich lather very quickly, I personally wet my beard and then rub the bar on my beard, I know some rub it in their hands and then onto the beard but either way you will get an incredible result and beard wash. I was trying to think of how to describe the smell and today my wife hit the nail on the head, for us oldies it is reminiscent of the soap we had at school back in the 70’s. I got a damn good beard wash from the Pine Tar Soap from Beardsmith, my beard was left feeling soft and its the best result I have had from a soap. If you are looking for a beard soap then I highly recommend this soap and that is why I have given it the Gold Cup Award. I am also going to use this in the shower for an all over wash as its so good. Pine Tar Soap from Beardsmith contains Olive Oil, Coconut Oil, Cocoa Butter, Pine Tar and Water. Pine Tar has many uses, traditionally it was used to preserve wood and ships rigging, it’s now used on the hooves of cattle and horses as an antiseptic and used to treat some skin conditions. 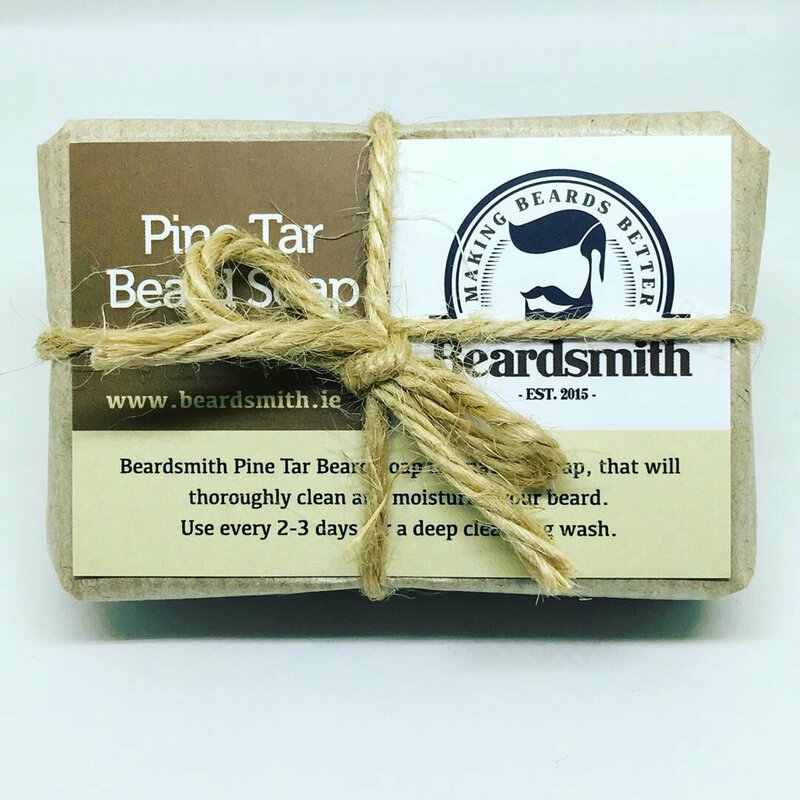 Pine Tar Soap from Beardsmith can be bought online for €5.49 and you can keep up to date with Beardsmith on Facebook and Instagram. All Natural Beard Care Products – Handmade in Kerry, Ireland.